The Rancho Mirage Wine and Food Festival (RMWFF) is a true wine connoisseurs delight. The RMWFF is about people coming together to celebrate a shared passion; a love for great wine and mouth-watering gourmet food. Join us on February 17, 2018 to experience the Coachella Valley’s premier wine event. Come sip, swirl and savor a selection of over 200 handcrafted wines from top tier wineries. These passionate winemakers and winery representatives will be offering practical knowledge and sharing their delicious wine. 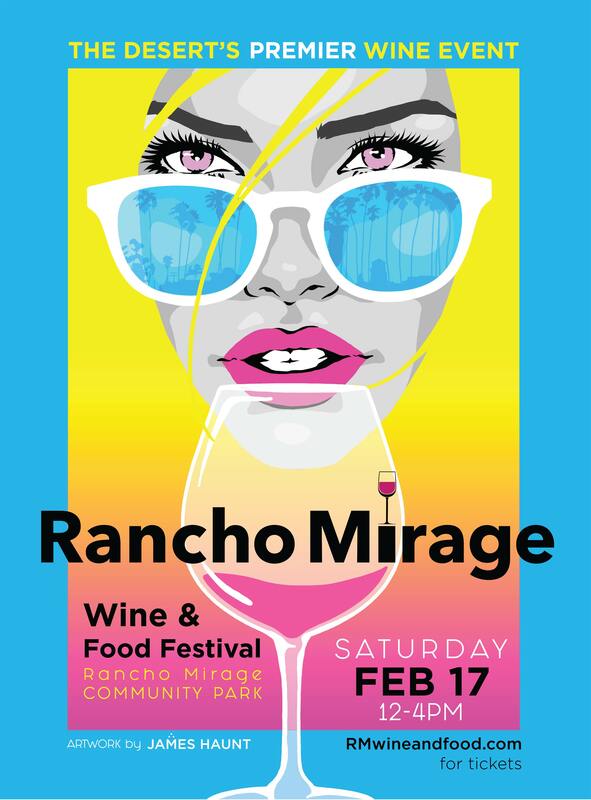 A Wine and Food Lover's dream will come true on February 17, 2018 during the Rancho Mirage Wine and Food Festival at the Rancho Mirage Amphitheater and Community Park. Join us to enjoy over 200 incredible wines and cuisine from 15 of Rancho Mirage's very best chefs. Award winning wineries will be pouring their world-class wines from Napa, Sonoma, Paso Robles, Santa Barbara, Lodi, Washington State, The Santa Lucia Highlands, and Temecula. Enjoy an afternoon of unlimited fun, wine, food and live upbeat music – at the premier wine and food festival under the sun! If you love wine and great food, then the Rancho Mirage Wine & Food Festival is the event for you! The Rancho Mirage Wine & Food Festival Early Entry allows the ticket holder to enter 1 hour early at 12:00PM before the general public. Ticket includes wine tastings, food samples, entertainment, and your own souvenir crystal wine glass. VIP tickets are limited to only 350; these VIP tickets are very popular and sell out FAST! Gates open at 1:00PM for General Admission. Only 2,500 tickets are available to this high demand Sell Out Event! Ticket includes wine tasting, food samples, entertainment and your own souvenir crystal wine glass. We highly recommend taking public transportation or having a designated driver. The law is very strict on drinking and driving. Due to ABC regulations, no one under the age of 21 will be allowed into the event. The Rancho Mirage Wine and Food Festival is a rain or shine event, all sales are final, no ticket refunds will be given. Only government certified service animals will be allowed into the event.